As the busy fall travel season approaches, there is a new push from Vermont State Police to encourage visitors to the state to be mindful of where they leave their purses and other valuables during leaf-peeping trips. "Don’t leave your things in plain view," advised Cpl. Andrew Leise of the Vermont State Police. Leise and other troopers are now monitoring lots at some parks and hiking access points that are popular with leaf-peepers, after dozens of car-break-ins were reported last year. On a patrol this week witnessed by necn affiliate NBC 5 News, Leise quickly spotted a purse left right on the passenger seat of an Audi. That could have made the vehicle an easy target, the trooper said, for a smash-and-grab. Leise’s message to visitors is that Vermont is a very safe state, but that theft happens everywhere, especially with the national opioid addiction epidemic. "They’re just shocked to believe they came to Vermont and their handbag was stolen and their vacation cash was stolen," Leise said of travelers he and colleagues have spoken to. 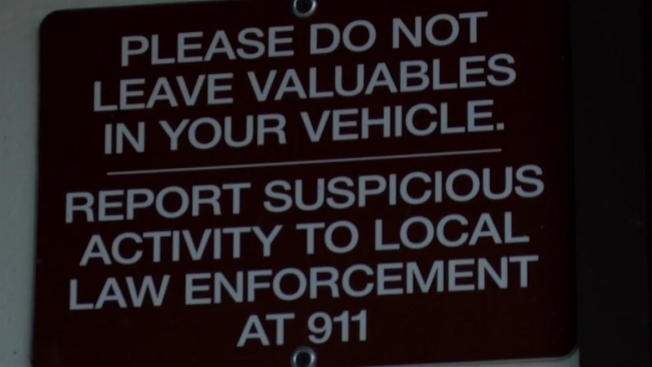 State Police are now posting warnings in high-risk areas, hoping the placards encourage people to carry their valuables with them when they’re out of their cars, or at least to hide them. "I usually take it with me or don’t bring it," hiker Michael Horgan said of his bag containing a phone and wallet. "I live close by, so it’s easy." "This is my favorite time of year to go hiking, so I think it’s pretty sad that’s something people have to worry about," hiker Camille Huey, a University of Vermont student, told NBC 5 News. The new education effort appears to be working. The Vermont State Police said so far, car-break-ins this year are down from last year, and they hope smart travelers help keep that trend going.